This pair of images taken a few minutes apart show how laser firing by NASA's Mars rover Curiosity removes dust from the surface of a rock. The images were taken by the remote micro-imager camera in the laser-firing Chemistry and Camera (ChemCam) instrument during the 84th Martian day, or sol, of Curiosity's work on Mars (Oct. 31, 2012). The area covered in each image is about 2.8 inches (7 centimeters) across, on a rock target called "Rocknest_3." 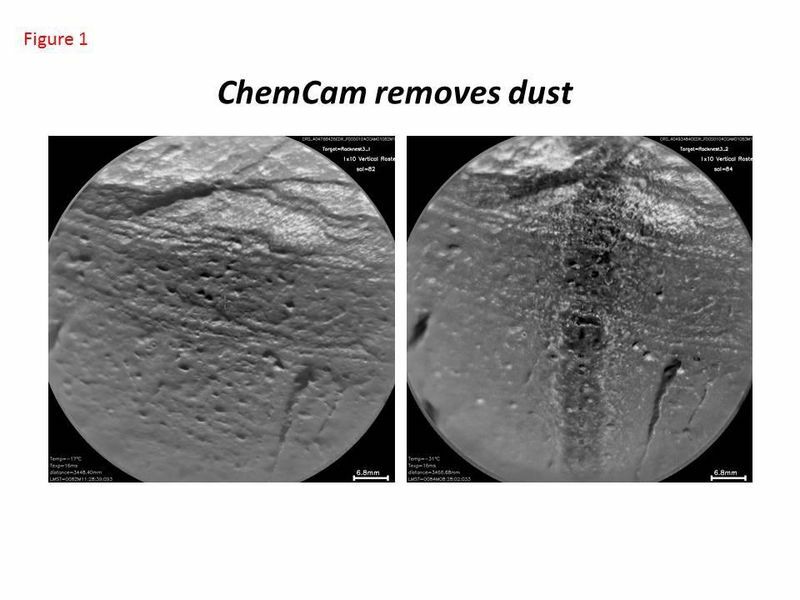 Between the time the remote micro-imager took the image on the left and the time it took the image on the right, ChemCam fired its laser 300 times -- 10 bursts of 30 shots -- along a vertical line. 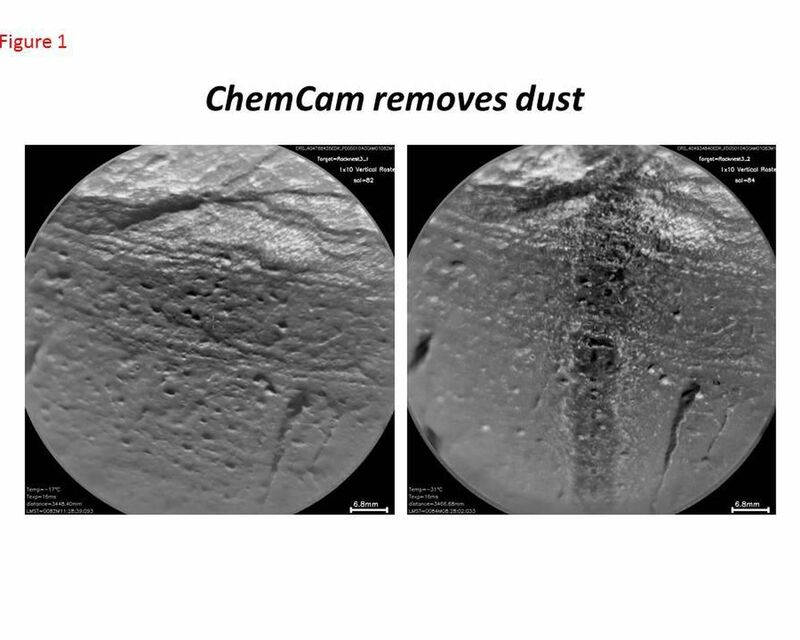 The image on the right shows that a stripe of dust was removed. The interaction of the laser beam with the surface is on the order of 0.02 inch (half a millimeter), but the stripe is more than 10 times wider, on the order of 0.3 inch (7 millimeters). A shock wave that occurs when the laser hits the rock is responsible for the wider area of dust removal. Dust tends to cover everything on Mars. 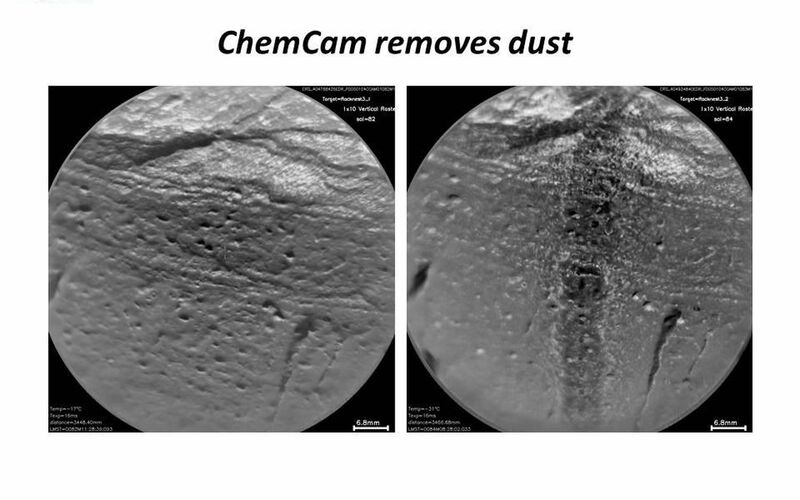 ChemCam has the capability to remove this layer to access the underlying rock and expose dust-free surfaces to other optical investigations.